Valiant is proud to announce a partnership with HQM Editora, Brazil’s premier publisher of Portuguese language comic books and graphic novels, to bring the Valiant Universe to a new generation of fans in South America. 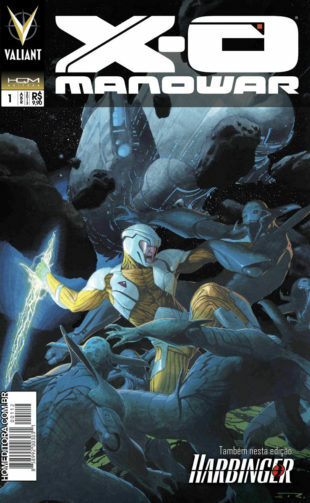 Beginning this May, HQM Editora will launch a new, dedicated line of Valiant releases with the first serialized translations of three of Valiant’s best-selling ongoing series in the pages of X-O Manowar Magazine – an oversized monthly anthology re-presenting X-O Manowar by Robert Venditti and Cary Nord; Harbinger by Joshua Dysart and Khari Evans; and Bloodshot by Duane Swierczynski and Manuel Garcia. 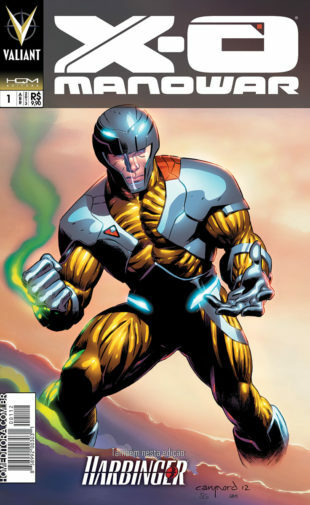 Compiling one issue of each series together in HQM’s oversized format, the release of X-O Manowar Magazine #1 will mark the first time Valiant’s monthly titles have been published in a foreign language since the publisher’s much acclaimed relaunch. After the conclusion of each series’ first story arc, Harbinger and Bloodshot will spin-off into a second monthly title, Universo Valiant Apresenta (Valiant Universe Presents), spotlighting the lead-up to Valiant’s first crossover event, Harbinger Wars. Trade paperback collections of each translated series are slated for release later in 2013. “Valiant has some of the best creators and their stories are explosive. There’s no strings attached and that will attract people,” said HQM Editora Executive Director Artur Tavares. HQM Editora began publishing in 2006 with the first Portuguese language editions of Robert Kirkman’s The Walking Dead and Invincible and, in the years since, has produced Portuguese translations of a distinguished array of titles, including Neil Gaiman & Dave McKean’s Violent Cases, David Lloyd’s Kickback, Todd McFarlane’s Spawn, Terry Moore’s Strangers in Paradise, and Dave Steven’s The Rocketeer. For more information on HQM Editora, visit www.hqmeditora.com.br. For more information on X-O Manowar, Harbinger, and the rest of the Valiant Universe, visit Valiant on Facebook, on Twitter, or at ValiantUniverse.com.